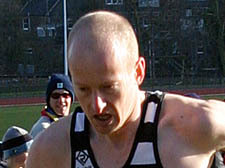 HENRY Dodwell (pictured) strode to victory for Highgate Harriers on Sunday in the London Heathside Five Miles Road Race in Finsbury Park. Dodwell crossed the finishing line in 26.24, with Highgate’s Chris Beecham hot on his heels in 26.47 and Declan Hamblin of London Heathside taking third (27.56). Stephen Whiting (28.07) was the final scorer in Highgate’s winning team and the first over-40 runner, with Heathside’s Andy Welshman taking sixth place (29.29) and second over-40 position. Heathside’s Emilia Vynnycky came home in 36.01 to finish sixth woman overall and Fiona Holland was first over-45 runner (37.27) in the race, completed by 196 runners. Highgate’s Glen Saqui was an impressive 24th of 11,181 finishers in a competitive Reading Half Marathon field on Sunday with a time of 1:10.37. Saqui’s club mate Esther Evans recorded 1:21.12, while over in Chichester, Highgate’s Daniel Higgins was seventh in the Mad March Hare 20 miles road race with 2:00.51. Saturday saw the final North West London Young Athletes League cross-country meet of the season, with Highgate's under-11 team of Daniel Lavin, Peter Laing, Gabriel Springer, Keshin Harrison and Arnold Harrison sharing the winning trophy with Barnet. The under-15 girls team of Samara Williams, Amy-Jane Cotter, Stella Sabin, Georgia Doolan, and Mei Corbett won their division outright. Williams took gold for five league race wins, while Cotter and William Laing won silver in their age groups. Highgate sprinter Simeon Williamson will fly the flag for north London and Great Britain on Friday when he competes in the 60m at the Indoor World Championships in Valencia. POWERFUL runs from young athletes from Camden secured victory in the Inter Borough Challenge road race trophy at Finsbury Park on Sunday. 15-17 3km race in 11.55. Se Oba-Smith took gold in the boys’ 11-12 2km race (7.25) and William Laing came in first in the 15-17 3km race in 10.07. Silver medals went to Amy-Jane Cotter, Hannah Ashman and Max Hayhurst, with bronze won by Sophia Parvizi-Wayne, Lottie ­Sorbie, Amber Fahey, Renat Hammet­Millay and George Laing.